You are reading this because you are concerned about a very serious Health issue: Pressures Sores. The death of Christopher Reeve (aka Superman) was attributed to an infected pressure sore. 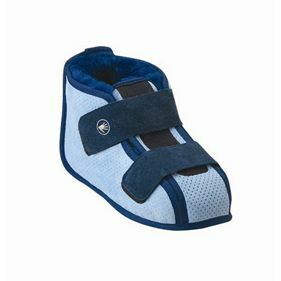 Bedsore & Pressure Sore Prevention and Treatment is now possible with the use of Australian HiTemp UR Medical Sheepskin and Merino Wool products. 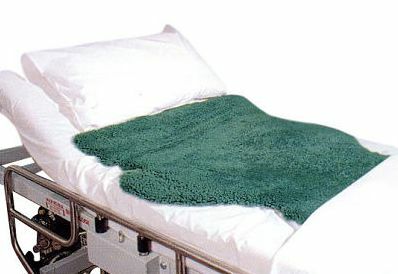 Proven in clinical trials and approved by the FDA, Australian HiTemp UR Medical Sheepskins now offer those confined to a bed or wheelchair 24/7 protection and increased comfort. Want to prevent pressure sores? You can by using Medical Sheepskin & Merino Wool Products. Choose from our comprehensive collection of products shown in the Online Store . Australian Medical Sheepskins can be machine washed in Woolskin and machine dried...and so much more...they are the BEST. Guaranteed to withstand 50 washes without losing their therapeutic properties makes them easy to care for, effective and economical for long term use. Medical Sheepskin products create a comforting and protective environment that prevents pressure sores, bed sores and decubitus ulcers. The Wool of these sheepskins, unlike any other fibre, can absorb moisture up to 33% of its own weight and still feel dry against the skin. This and many other unique properties makes wool an ideal perspiration and incontinence solution. Merino sheep have been domesticated and bred in ways that would not allow them to survive well without regular shearing by their owners. They must be shorn at least once a year because their wool does not stop growing. If this is neglected, the overabundance of wool can cause heat stress, mobility issues, and even blindness. You can prevent and treat bedsores, pressure sores and decubitus ulcers just like the professionals. Use this site to learn about and buy Medical Sheepskin Merino Wool Products for Pressure Sore Prevention. Use your sheepskin in your bed and chair; 24/7 for maximum benefit. View the Down-Under Wool product list and online store. FREE Shipping & Handling for orders more than $180.00. Orders to U.S.A. addresses are TAX & DUTY FREE. Pressure sores often develop in the tail-bone area first, followed by the heels. Get natural relief and prevention with these prevention products. Use also to get relief from inflamed joints, pressure points, bedsores, aches, or pains. Recognised around the world, Merino products feel silky, soft and create a new feeling of well-being. Medical Sheepskin pressure relief pads give relief and comfort because of their ability to reduce pressure, skin moisture & shear..the 3 major causes of pressure sores and bed sores. Skin that is delicate and susceptible to skin tears is affected by shear forces, pressure and moisture. Fine Merino Wool fibres of Medical Sheepskins do this and more. Each 30mm long fibre acts like a tiny spring. When you lie on a sheepskin, millions of these 30mm wool springs reduce the pressure on your body. This pressure reduction will be particularly noticeable at pressure points. Shear reduction results in less pull and stretch of blood vessels; enabling better nutrient supply to the skin. Wool fibres also wick moisture away from the skin, keeping it dry for improved skin integrity. Only wool absorbs moisture up to 30% of its weight, without feeling wet. 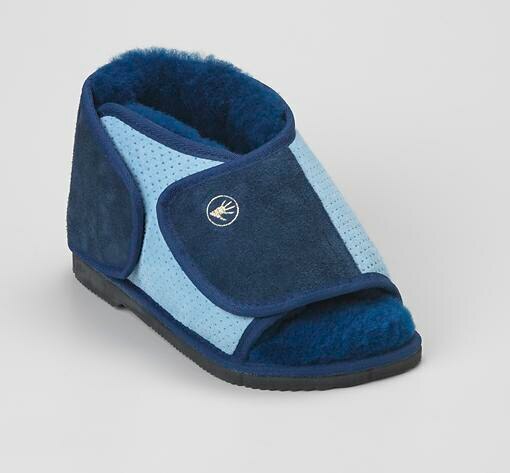 Down-Under Wool specialises in developing & supplying Medical Sheepskin & Merino Wool products for the Prevention and Treatment of Pressure Sores, Bedsores and Decubitus Ulcers. 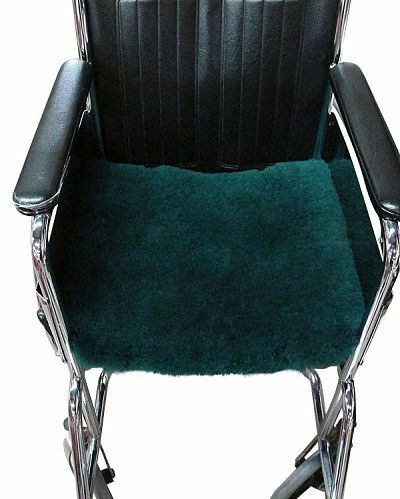 Australian Medical Sheepskins AS4480.1 are identifiable by their distinctive green colour, permanent label bonded to the leather, length, size and washability. Being HiTemp and Urine Resistant makes these sheepskins compliant with hospital disinfection standards. These are the only sheepskins recommended for incontinent users and are approved Medical Devices in Australia, Europe and the USA. Above normal pressure, shear, friction and skin moisture are major causes of pressure sores, bedsores and decubitus ulcers. 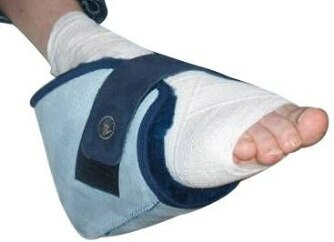 If the person you care for is having a pressure sore problem, it is important to act promptly. Bed Sores, Pressure Sores and Decubitus ulcers can develop in only 20 minutes and many take up to 6 months to heal. Use these Bed Sore Prevention products to maintain the skin integrity of people confined to a bed or wheelchair.... before it is too late. 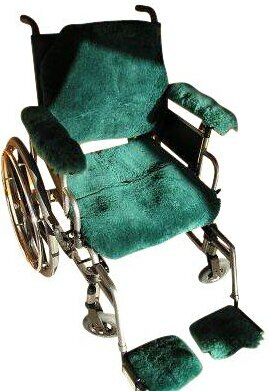 Use of bed pads, chair pads and other cushioning devices will greatly assist anyone who is confined to a bed or wheelchair. For more information about Pressure sores, Bedsores and decubitus Ulcers, click here. Use these products to improve comfort after hip, shoulder or knee surgery. It is not difficult to understand why sores can develop on heels, the tail-bone and elbows. Here, frail skin meets the unyielding surface of a bed or chair and the circulation is impaired. Tissues are deprived of blood, the skin breaks down and a pressure sore / ulcer develops. Economical and effective Bed Sore & Pressure Sore Prevention and Treatment is now possible with the use of Australian HiTemp UR Medical Sheepskin, Pressure Smart XD and Merino Wool products. These products have been proven effective in clinical trials and are approved by the FDA, CE and TGA. BE AWARE! 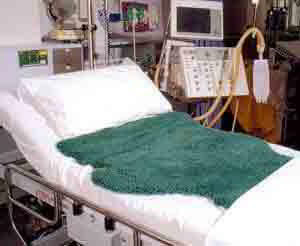 Most green medical sheepskins are HiTemp and not Urine Resistant (UR). Unless a sheepskin is both HITEMP AND UR, it is not recommended for incontinent users. 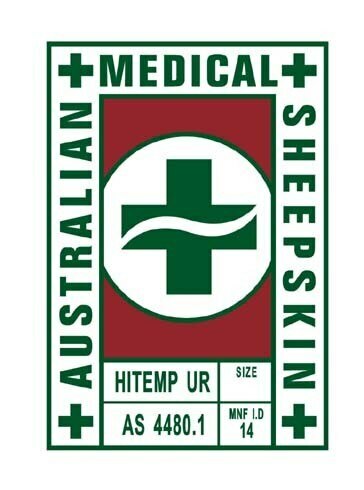 Only medical sheepskins with the Stamp (see marks: HITEMP, UR and AS4480.1 on the stamp ) are Authentic Australian Medical Sheepskins and will not be damaged by urine and urea. Guaranteed. Summer! A common misconception is that "wool and sheepskins are hot in summer". In fact, the converse is true. Wool is an excellent insulator and stops heat from your mattress or chair from passing to your body. Wool wicks perspiration away from your skin and then evaporates, keeping dry and cooler. 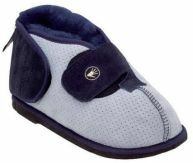 These medical sheepskin products will make the user more comfortable and protected in summer. Winter! Most people understand that wool is a good insulator; making it the ideal fibre for staying warm. Wool insulates so that body heat is not lost. Wool helps to create a constant body temperature and an enhanced feeling of well being. Wool also protects and prevents pressure sores. FREE Shipping & Handling for orders more than $180.00. Orders to U.S.A. addresses are TAX & DUTY FREE. For advice or Product Information, click or call 1800-463-1985. Down-Under Wool has been the benchmark for product innovation, quality and service in the medical use of sheepskin & wool since 1988. Located in Niagara Falls, Ontario, we want to make sure that you receive the products best suited to your need. Authentic Australian Medical Sheepskins are FDA and CE approved medical devices. To see product reviews, click here.